Bid on original art and crafts by local artists at the Friends of the Field Station silent auction. A great opportunity to acquire unique items while helping the Friends. 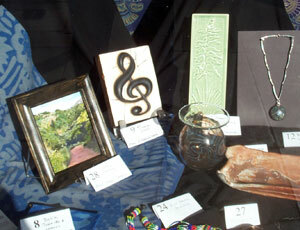 The items will be on display in the front window of the Folk Music Center. When: All of March. View items anytime during the month; place bids inside the Folk Music Center Tuesday-Saturday 10 a.m.–6 p.m. and Sundays 11 a.m.–4 p.m. The Friends will have a booth at the Claremont Earth Day Celebration with free coloring books of BFS plants and animals for kids (of all ages! ), as well as informational displays. The Friends of the Field Station will participate in Claremont's Independence Day Celebration with an information booth and a parade entry. [Click here to see our 2005 parade entry]. Everyone is welcome to join our group in the parade! When: Booth 9:00 a.m.–4:00 p.m.; parade starts at 4:00 p.m.